Arrival on the October 11 in Manila via Bahrain & Paris (5 days spent in & around discovering the city). Departure by plane on October 16 south for the small tropical island of Boracay for three days spent in paradisiac settings. Departure by plane on October 18 for Cebu city about an hour flight again south. Departure by fast ferry on October 21st for the Island of Panglao & Bohol. 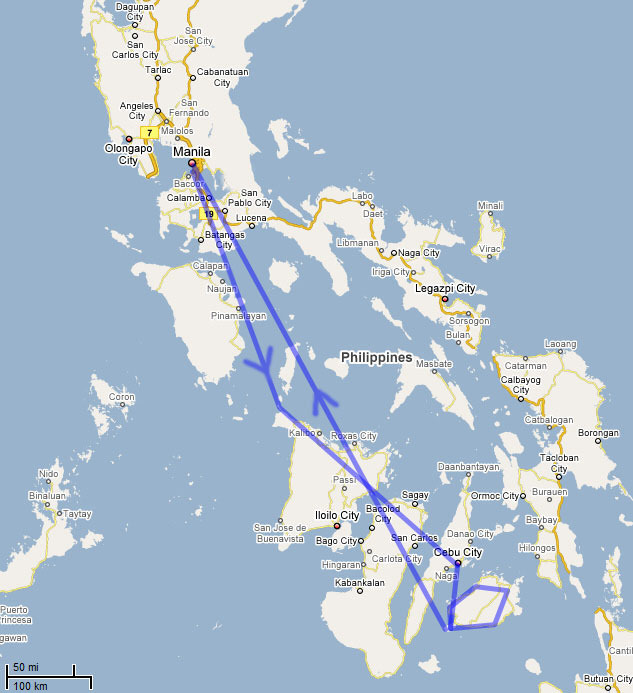 Departure by plane on October 23rd from Bohol to Manila for one final night in the city. Leaving back from Manila on the 24th when I arrived home but 36 hours later.